Ashley Watson designs protective motorcycle clothing for use on and off the bike. Made in England, our products are engineered to combine form and function in equal measure – the result of our passion for motorcycle travel and search for uncompromised design. This is motorcycle clothing, the way it should be. As with all journeys; there are a sequence of moments, dots, which join from one to the next and trace back through your memories - shaping the choices you make long before you stand at a crossroads. The path that led me to design motorcycle clothing began long before I knew it had started, in a home with a garage full of tools. One parent an engineer, the other an artist; always experimenting and neither afraid to find ways to build the ideas conjured by their imaginations. I cut my teeth illustrating prints and then moved to denim - learning the ropes and honing my skills. After three years in-house, I worked for another four as a freelance designer. I listened, learned and as the gaps in my knowledge filled, I moved closer to my dream of setting my own briefs. These formative years were an apprenticeship of sorts. I learnt my trade without the comfort of a safety net. There was no margin for error, no one to lean on. Tough as it was, I’m thankful. It has given me the tools I need. Motorcycles mean different things to different people. For me, it’s about possibility; where a bike can take you, what you might see, what you might learn. Even if I’m not able to get out on my motorcycle, knowing it’s there is enough. It’s a line for my imagination to follow. I ride year-round, in all weathers. In winters so cold that I’ve lost the feeling in my fingertips within minutes. I’ve gritted my teeth through hours of driving rain, followed dirt tracks under the blistering heat of the desert sun and have felt the sharp, cold air as I've passed through the shadow of a mountain at dawn. To me, whether it’s a short run out of town or an expedition further afield, at their core, they share the same sense of freedom. This is what I design for. When I put pen to paper to combine my passion for design and motorcycles it was a daunting prospect. I saw decades of motorcycle heritage stacked high before me. Who was I to step into the ring and hope to add a piece to the puzzle? A year into this project, a passing comment from my father turned these thoughts, ‘your Great Grandfather used to ride bikes, we have a medal he won somewhere’. Eyes up, everything else forgotten, I searched until I found the medal he spoke of. Tucked away at the back of an old bureau, it turned out to be not just the one medal but several. There were pictures of my Great Grandfather on his bike, his workshop, a cutting from a newspaper describing a crowd cheering his win at a trials contest. It fired my imagination. Over a century ago, Fred Watson, my Great Grandfather, rode one of the first Triumph models ever made - a 3.5php single cylinder motorcycle boasting a top speed of 40mph. Only 3000 of these machines were made. 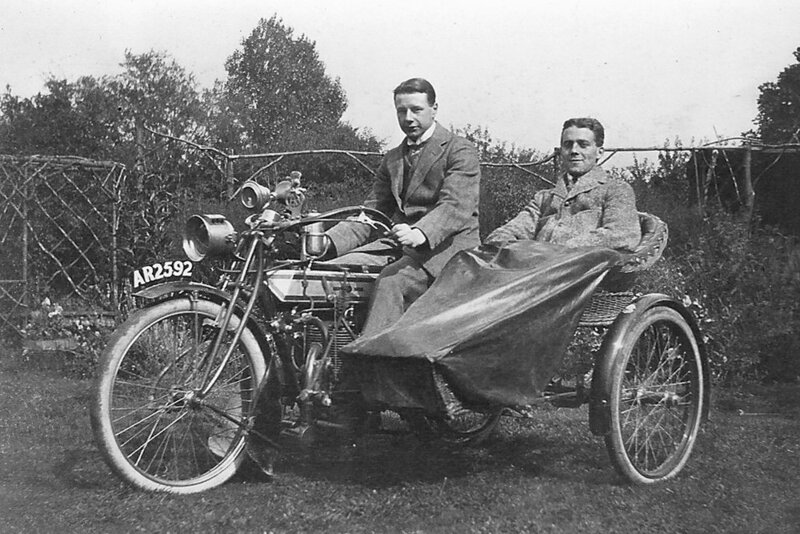 He was awarded a gold medal by The Motor Cycling Club for a non-stop race from London to Edinburgh on 2nd June 1911. Starting from Highgate Gatehouse at 9.47pm, he rode through the night to arrive in the Scottish Capital at 7.33am. It all made sense. I could look back and see that at every crossroads, the dots that have shaped the choices I’ve made ran back further than I could have imagined. A seed planted over a century ago has rooted my work and given me certainty in my direction - an anchor like no other. I will only begin a project if I think I can improve on what’s been before. If a problem has already been solved, move on. I use the knowledge gained riding throughout the year to know what works and what doesn’t, what I need but can’t find. I boil down to the essence of the problem – what a product needs to do, the purpose it needs to serve. This sets the parameters of the brief. As I form the design, I use this understanding to ensure that every element is fit for purpose. I believe in doing things once and doing them well. No shortcuts. Each product I create is rigorously tested on the road; the only place that you can truly understand if a design works in the way it should. Sometimes that’s a weekend trip, for the Eversholt Jacket it was a 4000-mile expedition. Working with specialist manufacturers here in the UK, I keep testing, keep tweaking, keep pushing the design - until I know it works. The Eversholt Jacket is testament to this process and has set a foundation for what’s to come. Form and functional in equal measures. Motorcycle clothing, the way it should be.